The Chemehuevi Indian Tribe has a rich history and culture. And their beautiful new Cultural Center had four blank walls calling for attention. Dr. Jay Cravath, the Tribe’s Cultural Director, collaborated with Tribe Members and Hattas Public Murals to create four 10-foot murals telling their story. 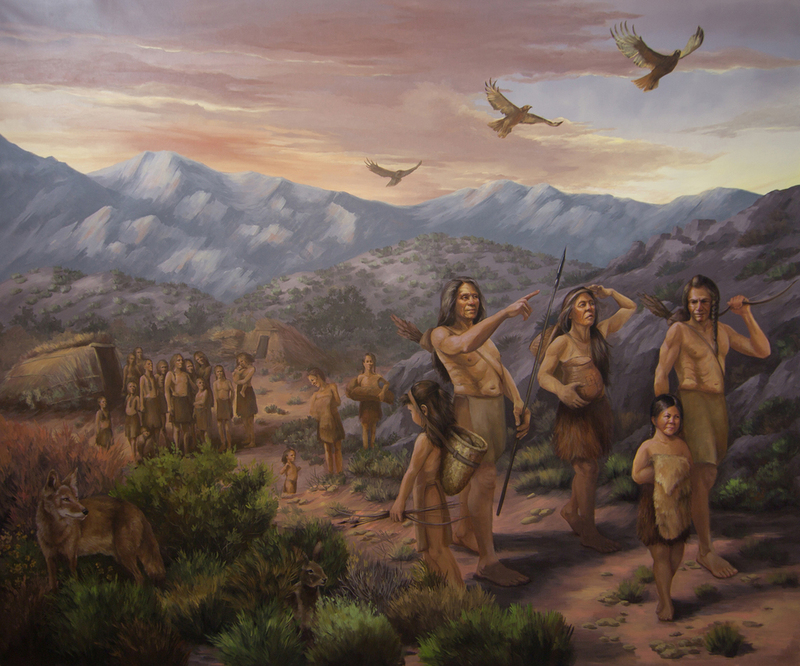 This mural shows the Chemehuevi moving away from the Southern Paiute in Utah and Nevada—and their generational journey into the Mojave Desert. This is a pivotal event for the Chemehuevi Tribe, for after Parker Dam was built to create Lake Havasu, the tribe was forced to leave their homes and farms—which became inundated with water. In 1970, some visionary former members got the United States government to again recognize them as a tribe and give land for a reservation. The Salt Songs are a song cycle of over 140 pieces that tells of the Chemehuevi’s travels throughout various areas of present-day California, Nevada, Arizona and Utah. They are sung at funerals and memorials to assist the soul of one who has passed through various areas described in the songs and finally to the place of the ancestors.